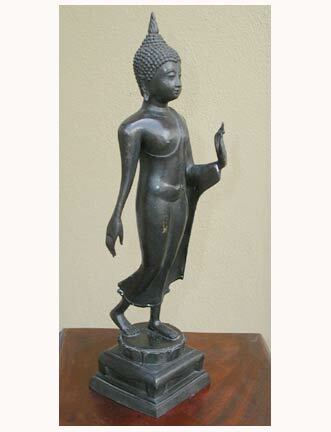 If you know what to look for, you can tell the meaning of a Buddha Statue by looking at the pose / posture, and the accompanying hand gestures. Each traditional pose has a significance related to an important event in the the life - or past lives - of the Historical Buddha. 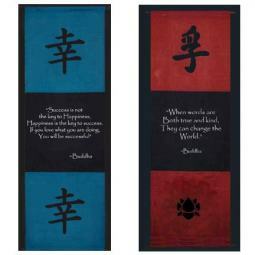 (Note: You can see more examples by Visiting our Buddha Statues For Sale Page on this site.) Also referred to as an asana or an Attitude, there are over 100 poses illustrating the life of the Buddha. And each posture will have a specific hand gesture, called a Mudra, associated with the posture. 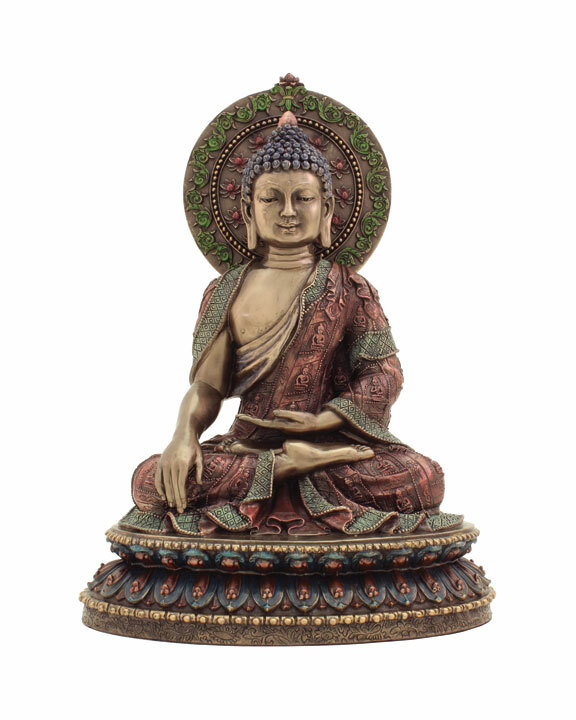 In general, the carvings of the Buddha that you can buy are representations of highly venerated statues that are enshrined at major temples throughout the world, or are reproductions of well known sculptures that were originally commissioned by royal patrons, and as such, their meanings and significance are similar to the original statues. 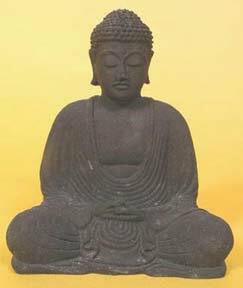 This depiction of a seated Buddha with the right hand raised and facing outwards has two common meanings. 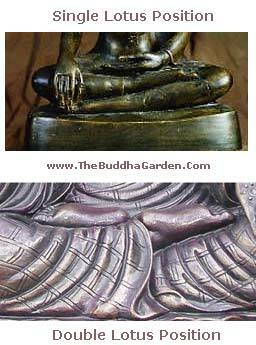 The first is that of the Protection Buddha, as the raised right hand symbolically represents a shield. The second meaning, Overcoming Fear, is closely related to the first (since one who is receiving protection would be less fearful). 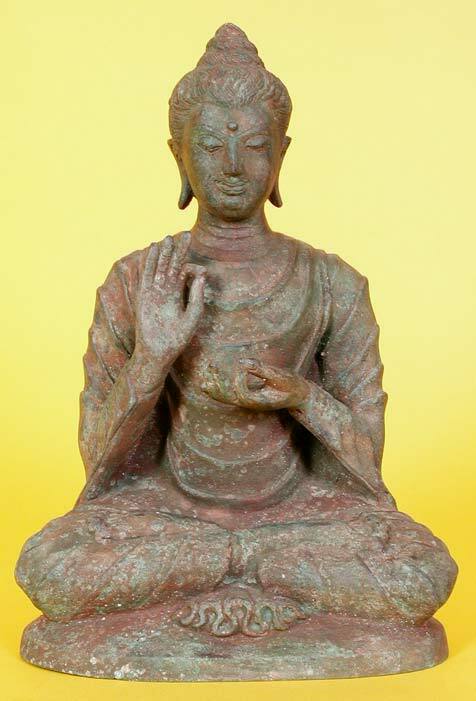 The main features of this pose, aside from the raised right hand, is that The Buddha can be depicted either sitting or standing, and the left hand may either be extended outward or palm up in the lap. 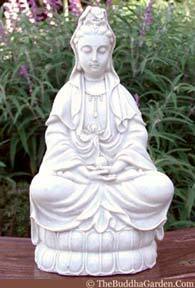 This statue signifies courage and offers protection from fear, delusion and anger. 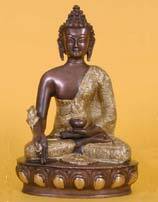 Another of the more common rupas is of the Buddha in Meditation. 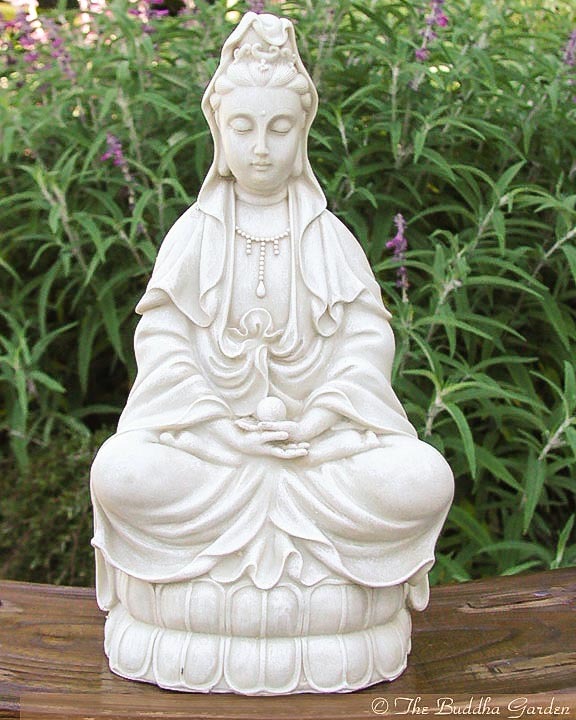 This statue is for people who are either looking for peace and clam in their lives, or for those who wish to improve their own meditation skills. 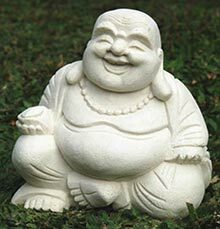 People will often buy a Meditation Buddha if they want to set up a "serenity room" or a corner of their house where they can sit in calm for a little while and unwind. 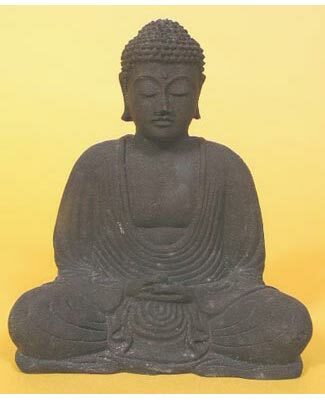 As this statue generally represents focused concentration, the eyes of the Buddha are either depicted as halfway closed, or closed nearly all the way. The silhouette of the statue is shaped - more or less - like a triangle, which represents stability. It is the story of how the Buddha, after six years, finally was at the verge of enlightenment. Unfortunately Mara, the Demon of Illusion, tried to dissuade The Buddha from the final last steps. The Buddha meditated all night to overcome the fears and temptations sent by Mara, and then called the Earth Goddess to witness that the Buddha achieved enlightenment in order to share with the rest of the world. Witnessing that, the Earth Goddess wrung her hair, releasing flood waters that swept away the Demon Mara and all the temptresses he had released. 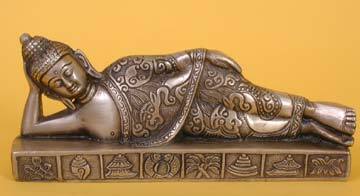 This statue depicts the Historical Buddha in the last moments of life on earth, prior to the Buddha dying one last time before entering Nirvana (often written in English as ParaNirvana when referring to the life of The Buddha). It is said that an alms giver had accidentally given the Buddha pork that had gone bad, and this eventually led to the death of the Buddha. Because the Buddha had gained enlightenment in this lifetime, the Buddha was able to escape the endless cycle of birth - death - rebirth (known as samsara) and was able to enter Nirvana. In this pose, the Buddha is always depicted lying on the right hand side on top of a resting table. One of the most well-known examples of this statue is enshrined at Wat Pho in Bangkok, Thailand, although there are numerous other temples throughout Southeast Asia that house statues in the posture. The Medicine Buddha is depicted in paintings having blue skin, but whether shown in statue or painted form, the right hand is held facing downward with fingers extended toward the ground, palm facing outward toward the viewer, a bowl of herbs rests in the left hand upon the lap. It is believed by the Tibetans that the Buddha was responsible for delivering the knowledge of medicine to the people of the world, and in fact the right hand facing outward signifies "granting a boon" (meaning, giving a blessing) to mankind. 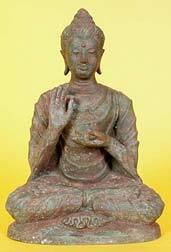 This is a common hand gesture amongst both Buddhist and Hindu statues. The Medicine Buddha is venerated by those seeking health, and is more commonly found in the Buddhist temples and communities of Nepal and Tibet. This statue signifies wisdom, understanding, and fulfilling destiny. Both hands are held at chest level, with thumb and index fingers forming a circle. The right hand is turned palm in, while the left hand is turned palm out. As do most images of the Buddha, the Teaching Buddha depicts a particular moment in the life of the Buddha, namely, the first sermon the Buddha gave after reaching Enlightenment. This sermon was to a small group of disciples who had previously scorned the Buddha. This is a statue that is particularly appropriate for those who are either studying or are interested in learning more about spirituality. The phrase DharmaChakra is hard to translate. The word Dharma means "the way of righteousness," while the word Chakra is usually translated as the "Universe" or as the "cosmos." Taken together, this phrase generally is interpreted as, "putting the cosmic law of righteousness in order," or "turning the wheel of cosmic righteousness." Signifies grace and internal beauty, and in Thai, we call this "Phra LeeLaa". Right hand raised, facing outward, left hand dangles along left side of body. Standing with right foot behind, starting to raise off the ground. This statue is particular to the Sukhothai period in Thailand. It represents a time when the Buddha was returning to earth after delivering a sermon on the Dharma in Heaven, and was being accompanied by Lord Indra and Lord Brahma. In this pose, Both arms of the Buddha lie flat against the chest, the palms of both hands facing in, with right arm on outside of left arm. 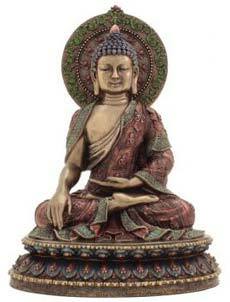 The Contemplation Buddha signifies quiet determination and patient understanding. Arms bent at elbows, holding an alms bowl at chest level. 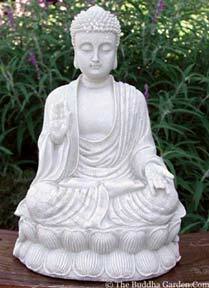 This statue signifies compassion and caring for all beings. Contrary to what many think, monks (and the Buddha) did NOT beg for food. Instead, they collected alms. The difference is that collecting alms allows for those GIVING the alms to make merit (meaning, to acquire good karma). Devout Buddhists in Asia will prepare and give food to monks in the morning on their alms rounds. This statue has two meanings based on two different stories. The first meaning of Repelling The Ocean comes from a story when the Buddha visited Bihar state in India. A hermit unleashed a wall of water hoping to cause a flood, but the Buddha used the power generated from meditating to stop the water from flooding the area. The Forbidding The Relatives from Fighting is related to a period in the life of the Buddha where relatives of his father had an argument with relatives of the Buddha's mother over water, as one of the rivers that both sets of relatives normally depended on was starting to run dry. The Buddha raised his right hand to draw attention to their own bickering and asked them what was ore important; water, or their family relations? 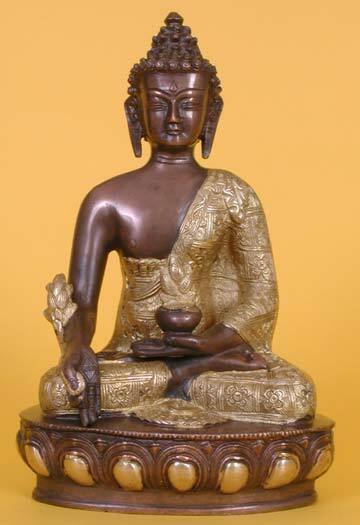 In general, the Buddha is depicted as sitting with the legs crossed. This makes a "triangle" shape to the image; the knees making the two bottom points of the triangle shape, while the tip of the head makes the top point of the triangle. The significance is that a triangle shape is more "grounded" or has a more solid foundation. There are two positions for crossed legs, namely with the right leg resting above the left leg in the Single Lotus Position, or with both knees pointing downward and the ankles tucked on top of one another in the Double Lotus Position. But there are a few postures that are not seated with crossed legs, namely the Maitreya Buddha, where the "Buddha of the Future" sits in a chair Western style. Also, there is a story of how a monkey and an elephant visited to make offerings to the Buddha, and in those images he is depicted sitting in a chair as well. there are standing Buddhas, and in Thailand, one of the most beloved forms is of the Walking Buddha statue, which is exclusive to the Sukhothai period of Thai art. In Thailand each day of the week is associated with a particular Buddha pose, and "your" pose is determined by which day of the week you were born. (The Thai zodiac puts as much importance on the day of the week - Monday, Tuesday, Wednesday, etc. - as on the actual date or month). So everyone born on a Monday would have one special posture, while everyone born on a Thursday would have a different posture, etc. Thus, everyone in Thailand knows which day of the week they were born. If you have ever been to a Thai temple, then you might see an area where there are 8 (not seven) small Buddha statues set aside, often with small bowls next tot them where you can make merit by putting money into those bowls. The money is then used to help maintain the temple. You make merit by donating in the bowl of the statue that represents the day on which you were born. Why 8 instead of 7 when there are only 7 days in a week? You'll see in a moment. Sunday: The Buddha stands with arms crossed over the stomach, right hand over the left, with the back of the hands facing outward. The eyes are open and this is a pose of mental insight. Wednesday BEFORE Noon: Alms Collecting Buddha (Thai people split Wednesday into two different poses - those who are born before noon on Wednesday and those born AFTER noon). Wednesday AFTER Noon: The Buddha sitting with a Monkey and an Elephant, which are giving offerings to the Buddha. This is a rather unusual pose that many westerners may not have ever seen before. 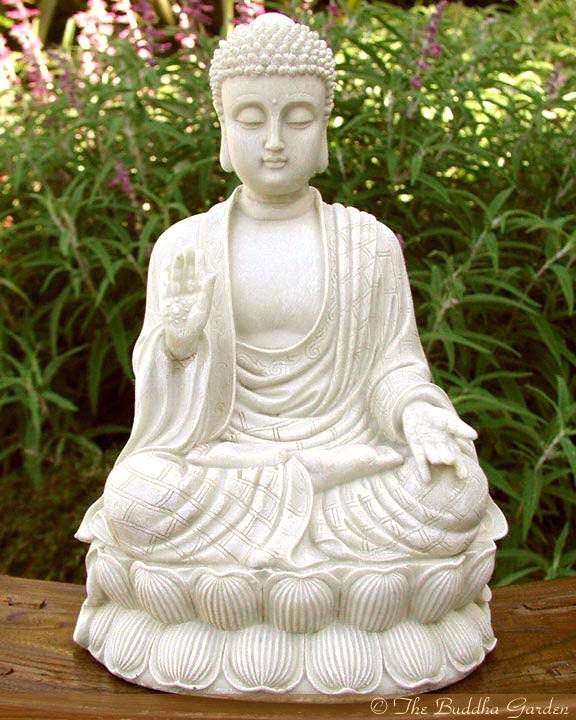 One of the images most frequently confused to be an image of the Buddha are statues of the Chinese Boddhisattva Kuan Yin, as well as the male counterpart Boddhisattva Avalokiteshvara. Both of these Boddhisattvas are important to the Buddhist cosmology, as they have forsaken the final step to Nirvana in order to help mankind reach enlightenment. But neither is, indeed, the historical Buddha. Ho Tai, as he is called in Chinese, is often confused with the Historical Buddha. But a word to the wise; Ho Tai is not the Buddha at all, but is actually a revered Chinese Monk. He is somewhat akin to the West's Santa Claus / St. Nick, since Ho Tai was famous for his Buddhist sermons and for his bag full of gifts, which he brought to children in order to reward them for coming to learn about the Dharma. Part of the reason Ho Tai is confused with the Buddha is because they both wear robes, and that in certain languages (Thai, for instance) the vernacular word for the Buddha and for Monks is the same, namely, the word "Phra." It can be confusing even for us Thai people, because if someone were to use JUST the word Phra, we might not know whether they were referring to the Buddha himself, a monk, a statue of the Buddha, or even an amulet (religious pendant) featuring an image of the Buddha... or an image of a highly revered monk!